Bill Clinton’s campaign strategist James Carville coined the phrase The Economy Stupid, often since echoed as It’s the X, stupid as a mantra for keeping focused. I prefer not to call people stupid. So let me just say we should pay more attention to energy flows when we talk climate change, otherwise stupid or not, nothing will matter. There is a certain rate of energy flow to the planet from the sun. Unless the planet can match that inflow by exactly the same outflow, the system is not in balance. The only way our planet can shed excess energy is by radiation to space. The only way we can increase the net outgoing radiation is by a temperature increase. So the thing of real concern is radiative energy balance [Pierrehumbert 2011]. So why then does everyone keep going on about temperature? It makes sense to measure the temperature on the ground because it has to increase if energy is flowing in faster than energy is flowing out (energy flow in > energy flow out), until the rate of outgoing energy matches incoming. If the temperature is not increasing while net energy flow in exceeds net energy flow out, we are not shedding the excess energy. Why is this important? To see why, we need to understand where the extra energy can go if it’s not increasing surface temperatures. 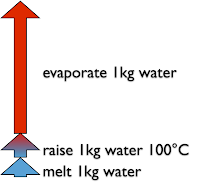 It is instructive illustrate the relative amounts of energy needed for latent and sensible heat by comparing the energy needed to raise water by 100°C (the range over which it can be a liquid at sea level), with the energy needed to melt ice and the energy needed to evaporate water. Ocean sequestration is important because many ocean ecosystems rely on the current stratification of ocean temperature, warm on top, icy-cold in the depths. Mess with that in a big way, and consequences for biodiversity and the food change could be dire, and are unpredictable with current knowledge. Also, temperature stratification is a major driver of ocean currents, something we disrupt at our peril. Another important factor is that this energy can periodically be released to the atmosphere resulting in sudden spikes in temperature (e.g. an El Niño event). What are some consequences of the latent heat part of the equation? If ice is melted, that is a positive feedback or amplifying effect. In other words, the radiative energy imbalance increases. Why? Because ice is highly reflective (in physics terminology, it has a high albedo). As long as the ice is only thinning there’s no change in albedo but once bare ground or water is exposed, the newly exposed darker surface absorbs more energy. If a region of the planet absorbs more energy, that pushes the net energy balance upwards, meaning temperatures have to increase further to balance the equation. 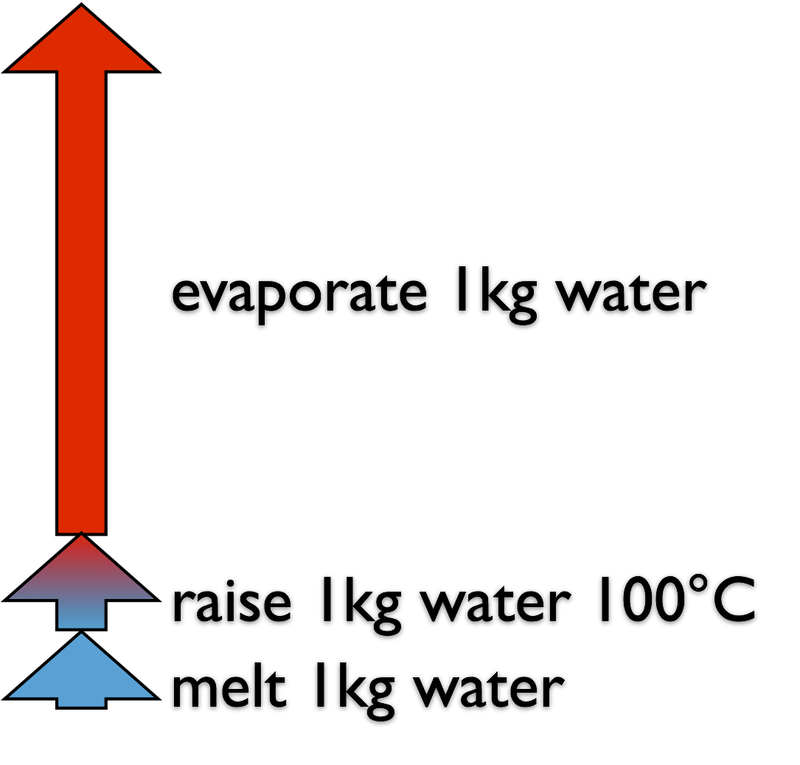 Latent heat of evaporation is not our friend either, for a different reason. Latent heat is in general terms a big deal because it can use up so much more energy than temperature change while a phase reversal can release that energy as a temperature change. For example, if water vapour precipitates out of the air, the energy of vaporisation returns to the air as a temperature rise. Latent heat is a major driver of extreme weather [Liu et al. 2011] because of the massive differential between the energy needed for a phase change and the energy needed for a 1°C shift. The really important thing about all this however is that these energy sinks can take up large amounts of incoming energy without changing the radiative energy balance. In other words, they do not fix the problem of energy flow in > energy flow out. Why does this matter? 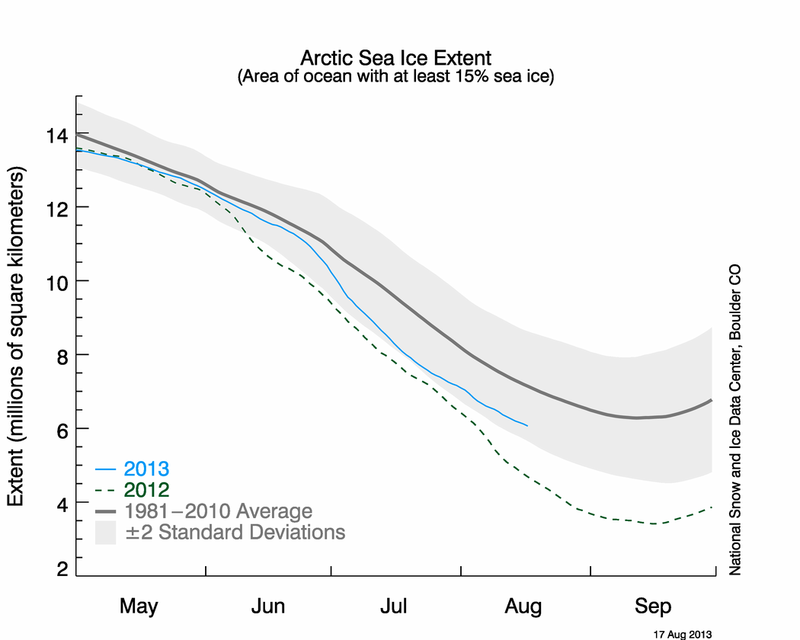 Because an apparent slowdown in temperature increase is not good news if the energy imbalance is still there. The extra energy is having a number of effects most of which are not positive – and temperature increase is still going to happen. If this is so important, why do we mostly talk temperatures not energy? Because temperature is something we can experience directly, something that is easy to measure and also a direct reflection of the energy increase, if not the only one. But most importantly, the surface temperature has to increase eventually so outgoing radiation can match the inflow. Why has energy not figured more prominently? Because at the early stage of concerns about climate change, we lacked the means to measure net energy flux, but we did have a long record of surface temperatures going back to the 19th century. Even now, with extensive satellite data, it is not practical to measure energy out with sufficient accuracy to measure the imbalance. First, the imbalance across the planet varies by time, latitude and date. During summer in one hemisphere, that hemisphere has a positive energy balance, while the opposite hemisphere has a negative energy balance. Those two imbalances sum to close to zero, and the difference is the net imbalance. The technology does not yet exist to measure the imbalance to an accuracy of 0.1W/m2, needed to measure the imbalance that the models infer [Hansen et al. 2011]. What evidence do we have that the energy imbalance is real? Until accurate direct measurements are possible, the best we can do is look for evidence that the effects other than temperature change are happening. Measuring ocean heat content is still a work in progress (with one paper indicating unexpectedly deep increases in temperature [Balmaseda et al. 2013]), and will be a key indicator. The most obvious one that is directly measurable is latent heat of melting. The Arctic has been losing ice rapidly throughout the period when temperature change has supposedly slowed down, indicating that the energy content of the planet is increasing in that region. In the absence of evidence that the energy content of the planet is decreasing anywhere else, that is an indicator that warming is continuing, even as temperatures are not rising sharply. conditions or unusually high global temperature. In any case is it really true that temperature change has paused? 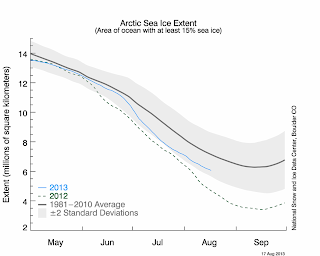 Aside from that the Arctic doesn’t care what we think and is losing ice regardless, what do the numbers actually say? If you take out the influences of volcanoes (particles they spew into the upper atmosphere have a cooling effect), the solar cycle (hint: cycle implies an effect that cancels out in the long term) and the El Niño Southern Oscillation (hint: oscillation implies an effect that cancels out – you guessed it – over the long term), the trend since 2000 is still up and statistically significant [Foster and Rahmstorf 2011]. My references are all from 2011 – except for a 2013 paper on ocean heat content, an area where further work is called for – recent enough to be current, old enough to have been refuted if wrong. A joule (J) is an energy measure. We measure the rate of energy use in watts (W). We also think of watts as a unit of power (intuitively, a more powerful engine burns energy faster). In electricity household consumption measures, a rate of usage is usually in kW, and we measure total energy use in kWh (thousand watts times hours: these are the units you may see on your electricity bill). kWh are just joules scaled to units that you can relate to your own consumption. 1kWh = 3.6MJ. You can derive this conversion from the fact that an hour is 3600 seconds. From this we see that water has a remarkably high capacity for storing energy. Although common liquids and fluids generally have higher specific heats than metals, water is near the top of the list. This property, combined with the ability of the oceans to mix temperature change faster than conduction allows (soil and rock, for example, can’t move warmth from their surface except by conduction), explains why the oceans, though only about 66% of the earth’s surface, absorb about 90% of any energy imbalance. Water albedo varies depending on the angle of incident light; a reasonable comparative figure to use versus ice is 0.06. Building long-term ice is aided by snowfalls because snow has such a high albedo, which reduces any tendency to warm from above after snow has fallen. And in case you were going to blame solar variation for global warming, check out this picture of solar variation measured by satellite (PDF original here). 1998 and 2005 are among the hottest years on record. 1998 was not far off a solar low. 2005 was well on the way down to the the next low. And the current solar cycle, due to peak some time soon if it hasn’t already, is way below the average. We should be experiencing 100-year lows in temperatures if it was only the sun causing climate variability. 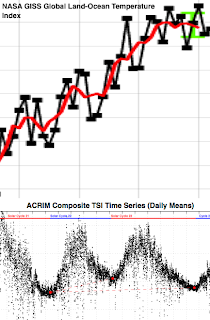 Compare solar variation with temperature (you can get the latest version of this from NASA). 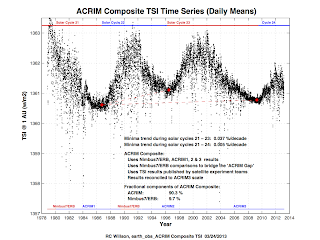 The satellite data starts in 1978, so ignore the earlier part of the temperature data. 1978-2012 temperatures clearly trend up (and this is even clearer if you do the stats – get the data from NASA and see for yourself if you don’t believe me). 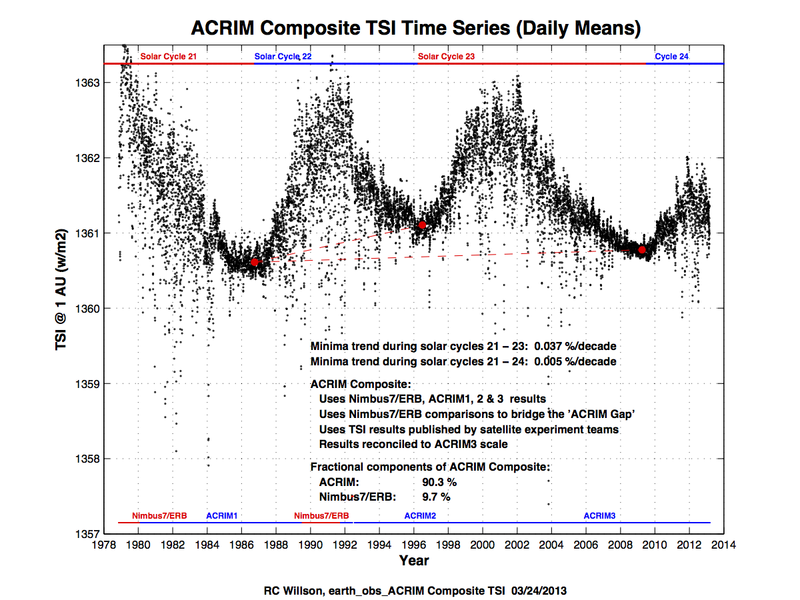 The solar cycle on the other hand is just an oscillation and the trend is down not up in the variation. Again, there’s data free for you to download if you want to check. To make it a bit easier to compare the two, I rescaled the NASA temperature data so it matches the time scale of the incoming solar energy data and chopped it to fit the satellite record. 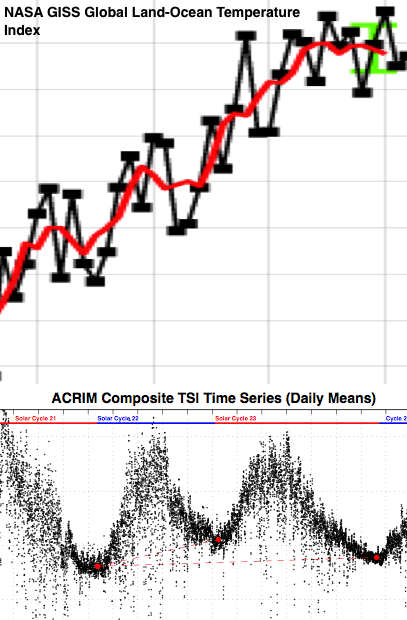 You can do statistical analyses to compare the two but, even without, it’s pretty clear that temperatures have been increasing while the solar cycle has not only doing its usual fluctuations but flattening out. And, remember, over the time that the latest solar cycle has been failing to peak at the same level as previous cycles, we’ve had record loss of Arctic summer sea ice. Mars: surface air pressure about 1% that of Earth. Fixing our climate here will be a bit easier than fixing that.